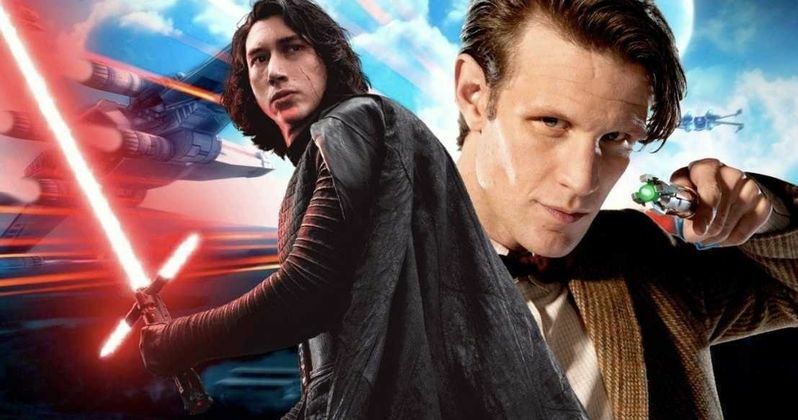 Matt Smith Says He's Not in Star Wars 9, What Happened? Matt Smith says that he is not going to be in J.J. Abrams' upcoming Star Wars 9. It was reported in August 2018 that the Doctor Who star was cast in a key role for the final installment of the Skywalker saga. Fans of the actor were immediately excited to see what Smith could bring to the Star Wars universe, with rumors first circulating that he was playing a young Sheev Palpatine and later that he was involved with the Knights of Ren. On a break from shooting Sony's Morbius the Living Vampire with Jared Leto, Matt Smith participated in an interview that went over his extensive career. However, when talk moved to Star Wars 9 and being in the movie, Smith simply said, "As far as I can tell, I'm definitely not," which is quite different than the reports that were circulating last summer. With that being said, the actor admitted earlier in the interview that he was great at keeping secrets from his work on Doctor Who. Could Matt Smith be throwing out misdirection? We've seen leaked concept art depicting Matt Smith as an officer in the First Order. It's entirely possible that Smith wanted to quickly change the subject, and flatly denying involvement is pretty easy way to do so. On the other hand, the actor doesn't really need to lie and could have redirected the conversation in another way, which more than likely means that he won't be in Star Wars 9 when it hits theaters late next year. With that being said, that doesn't mean that the actor won't be involved in the future of the Star Wars franchise in some capacity. When asked about Morbius, which just started production, Matt Smith didn't offer up any details, noting that Doctor Who co-star and Avengers: Endgame actress Karen Gillan gave him great advice about NEl6x4w9XRfToskeeping comic book movie secrets. Of course, he won't divulge what exactly that advice was, so we'll just be left wondering what Gillan had to say. As far as taking on the role in Morbius, Smith says that he really wanted to work with director Daniel Espinosa. Smith says that he waited on the comic book movies, but says, "This one felt right because of him," when talking about Espinosa. Maybe Karen Gillan gave Matt Smith some advice about a supposed Star Wars 9 role. For now, we'll just have to take the actor's word and assume that he won't be in the movie when it hits theaters at the end of the year. This will more than likely be some bad news for fans who were looking forward to seeing what Smith was going to do in the upcoming movie, but there's still a lot of work for the actor ahead of him. After Morbius, Smith goes right into Edgar Wright's thriller Last Night in Soho, which is begins production this spring in London. The interview with Matt Smith was originally conducted by The Los Angeles Times.